Britta Röstlund has been living in Paris for the past fifteen years, from where she freelances for Swedish media. She reports on everything from the Paris fashion week to the political state of France. 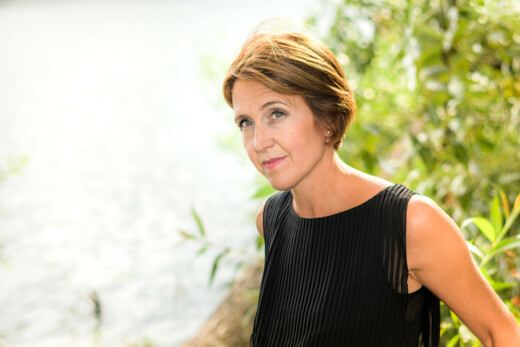 Röstlund's debut novel Waiting for Monsieur Bellivier has been sold to 13 countries and she is currently working on her second novel, set to be released in 2019. “I had never sat my foot in France before I moved to Paris fifteen years ago. I didn't know a word of French and I did not at all find the language as beautiful as so many others seem to. Still, it is only me left of the group of Swedes attending the French introduction course at Sorbonne. And I think I know why. The others had expectations on the city; I had none. Paris is in many ways a hard and difficult city to live in. It demands a lot. Every day it moves you. I love it. How it moves me is of lesser importance, but the city makes me feel. I need that. During one of the many walks I took to discover my new city I passed a grocery store with a little man sitting on a stool in front of it. A heat wave had just struck the city and I decided to buy something to drink. The grocery was on Boulevard des Batignolles, and in the distant along the boulevard I could hint the beautiful white church Sacré-Cœur. Inside the shop was a heavy smell of cooking, probably coming from the flat above. Heavily pregnant as I was the smell was probably intensified, and it wasn't perhaps as hot as I recall it, but it was exotic for someone coming from Stockholm. After the grocer had accepted my money he went back out to the pavement and again sat down on his stool and resumed to stare aimlessly over the boulevard. What is he up to all day long? That became my task to find out, and I gave him a name, Mancebo. When I work–write–I usually sit at a café in Paris' major business district, La Défense. Same easy chair every day; different people passing by outside. One day a man came into the café, he came directly at me and asked: ‘Are you waiting for Monsieur Bellivier?’ I shook my head, but he stayed. Finally he asked me again, and this time it didn't sound like a simple question, it was more like a code. Then the thought came to me: What would happen if I was to say that I was indeed waiting for Monsieur Bellivier?